Most of my sculptures need to be mounted on a wall, and in many cases the angle of mounting is critical. 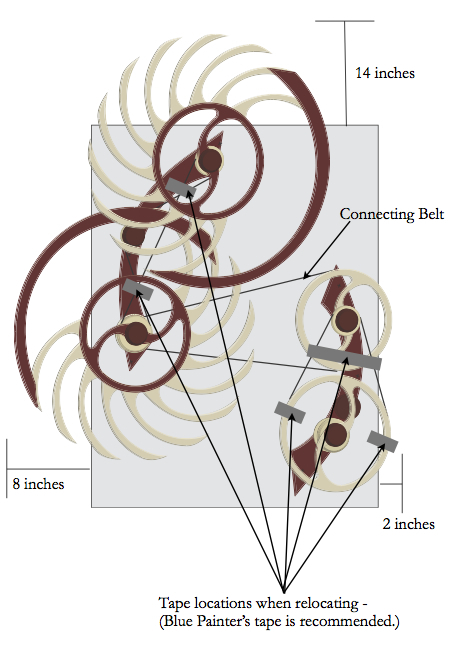 This is a step-by-step guide on the best way to install a sculpture at the correct angle. Note: Not all of my sculptures require a template. If yours does, it will be in the original box along with the instructions packet. The template is generally a large 24" x 32" piece of Masonite. I have chosen White Water for this demonstration because it has two parts. Some of my pieces do, many do not. This set of instructions provides you with guidance, not exact steps for your particular sculpture. Use this in conjunction with the printed instructions that came with your sculpture. Open the box from the side labeled "Open This Side". Remove the directions packet, with screws and anchors, and the Masonite template. Save the template, even when installation is complete. You will need it when the painters come! Explore in the packing material and look for a center axle. Lift the sculpture out of the box by picking it up at a main axle. Do NOT remove the blue tape holding strings and/or springs in place! Screw driver, or power screw driver with long phillips head bit. Notice the template needs to be placed with a clearance of at least 8" from the left, 14" from the ceiling, and 2" from the right. Place a screw in the upper most hole on the template. This step might take a little fussing and the assistance of a partner would be helpful. Hold up the major sculpture element to see if it is visually centered in the space. Spend time getting the placement correct so you don't have to fill incorrect holes later. Mark the location of the top most screw hole. 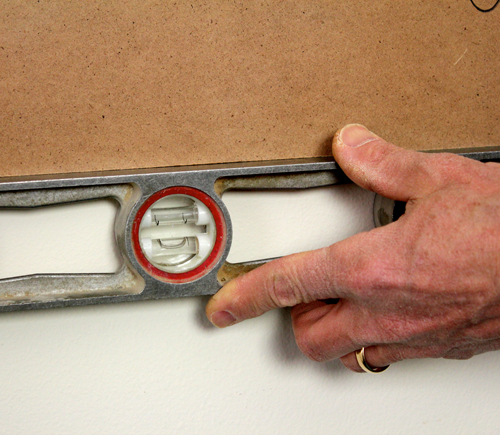 Position the template on the wall at the location where you determined the upper most mounting hole should be positioned. Screw the screw in part way, enough to mark it on the wall and to temporarily hold the template in place. Hold a level along the bottom edge of the template and adjust the template so that edge is level. Note the bubble in the level is exactly between the marks when it is level. Keeping the template level, screw in a second screw, this one only needs to go in part way, enough to hold the template level and to clearly mark the wall. 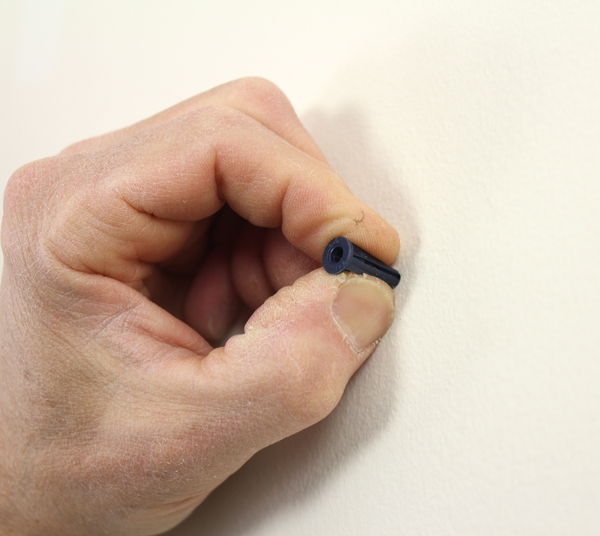 Place a screw in all holes on the template and screw them in far enough to mark their locations on the wall. Remove all the screws and the template from the wall. Note: I did not use anchors in this demonstration. I change sculptures frequently for work and need to be flexible with holes. I recommend using anchors in sheet rock and provide basic ones with the sculpture. Insert the anchors. 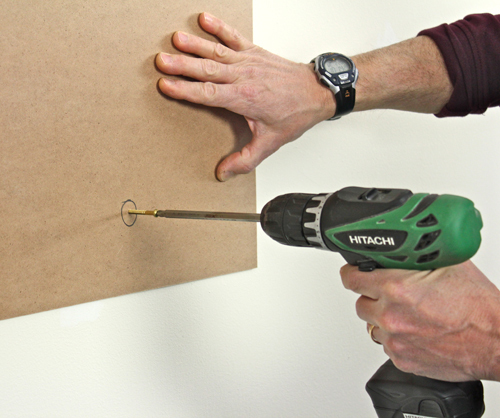 Start by drilling a 1/8" hole in each of the screw locations. Insert the anchor and gently hammer it into the wall. 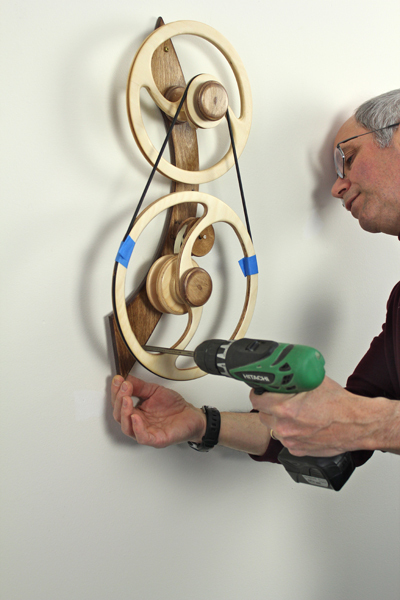 Take the one part of the sculpture (if it is a multi-part one like White Water), place a screw in the top hole and screw it into the hole you created in the wall. It often helps to have an extra pair of hands for this step. Place a screw in the lowest hole for this piece and pivot the sculpture on the top screw until the lower screw lines up. Watch from the side to make sure you screw it directly into the hole and not off to the side. Screw all the screws in place. The number differs on every sculpture. White Water has two parts. Screw the second part in using the same process as part one. 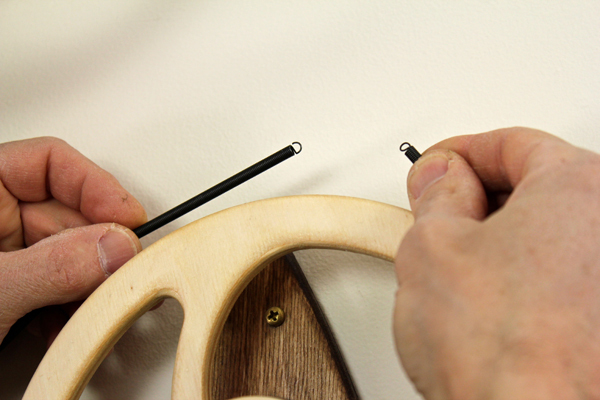 You might need to spin the wheels so that the screw driver has access from the least restrictive area. Now, once the sculpture is in its final location, you can remove the blue tape. Be sure to tape it back up if you ever decide to take the sculpture off the wall even just to paint. Follow the printed instructions to complete the installation. For White Water you need to add the belt. This is another job that is some times easier with an extra pair of hands. The belt springs have a little hook at one end and a loop at the other. Hook them together. Make sure all springs are in their respective pulleys and that none have slipped out. Wind the sculpture according to the printed instructions. The first time you wind up this sculpture after unpacking or moving requires special attention. Shipping may have caused parts to move unexpectedly. Only wind the spring TWO turns for the first run. Make sure the metal band is winding inside the larger spool walls. If it isn’t, shift it so that it does. It should be fine for all future windings. A short run will show you if parts slid out of alignment during shipping. If it doesn’t run as expected call David at 860-341-1234 or email him at david@woodthatworks.com. Wind only until you see the red warning tape. Do not over wind. 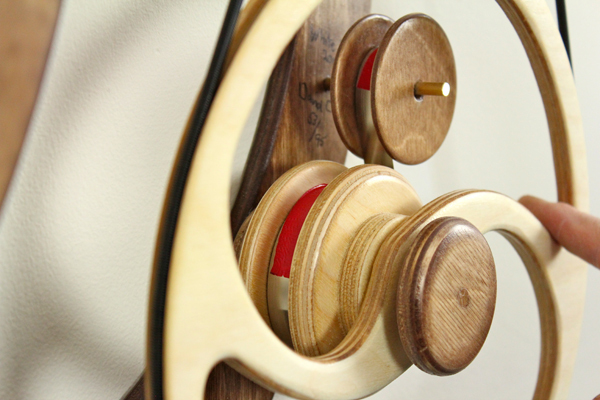 Over winding will eventually cause the spring to separate from the spool. Once the sculpture is wound, sit back and enjoy the motion!